This week after getting home from hunting camp I attended noon Mass at the Basilica of St. Michael the Archangel here in Pensacola. I was pleasantly surprised to see our Bishop Gregory Parkes celebrating along with three priests and a deacon! That’s pretty cool. After Mass they all came outside to shake hands and chat. The Bishop was glad I made it. He is a such an easy person to speak to and I think we’re very blessed to have him here in Florida! 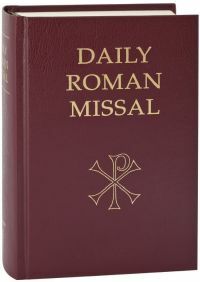 As my spiritual director said on Friday of the new Mass translations that go into effect today, “I can’t wait!” I have my new Daily Roman Missal and I’m ready. One of our local Catholic school principals made up a printable sheet with the new responses for students attending weekday Mass. You can open it by clicking on the image (pdf) or with this link (pdf) or this one (.doc). Feel free to open and print if you’d like. Cindy and I are thinking of going to our local Independence Day activities this evening that includes the Little River Band playing on the Missouri Capitol steps before the fireworks. That’s a great way to celebrate. But so is attending Mass! 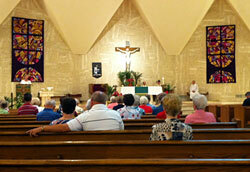 This is a photo from our morning Mass at the Cathedral of St. Joseph. Our new Associate Pastor, Fr. Nicholas Reed, celebrated. I would give up a hundred fireworks displays and free concerts to go to just one Mass as a way to celebrate this day. I hope everyone has a very safe and blessed celebration wherever you are. Last weekend I was working at the Iowa Corn Indy 250 race once again. Although it was a Saturday night race we had a Mass in the afternoon. 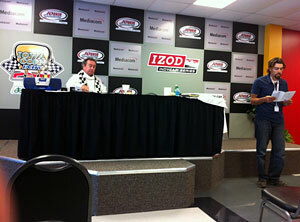 Like last year, the Mass was held in the press conference room of the media center at Iowa Speedway. Special thanks to the IndyCar Ministry for making this possible at race tracks everywhere. IndyCar Ministry is a 501c3 not-for-profit, non-denominational organization, which was developed to help the racing community. We exist because of the donations we receive from the racing community and great partners that join with us to reach out to the people that are part of this great sport. Our financial records are available for review by contacting our office. We desire to be good stewards of the blessings we are given. Happy Memorial Day Holiday. Many churches have a holiday Mass schedule. Hopefully you checked yours. 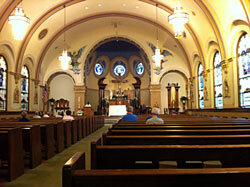 This morning I attended an early Mass at Immaculate Conception in Jefferson City, MO. Normally I would go to the Cathedral but the Mass there isn’t until 9am this morning. Today we honor, remember and pray for the souls of our deceased men and women who have died in service to our country. At 3pm today you may want to take a moment to say a prayer and remember these heroes. I’ve done a little road work the past week or so. 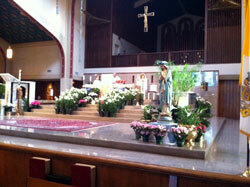 Week before last I was in Arlington, VA and was able to attend Mass at the Cathedral of St. Thomas More. I’ve been there before but not since when I worked for the Vitae Foundation. That’s been over seven years ago. It’s hard to believe my company is now over seven years old. This past week I was in Des Moines, IA and attempted to go to a morning Mass downtown before an 8am mtg. I tried St. Ambrose Cathedral first but there is only a noon Mass. Next I tried St. John’s Basilica. Same schedule. I don’t know why I find that hard to believe. A Cathedral and a Basilica and neither one has a morning Mass on a weekday? 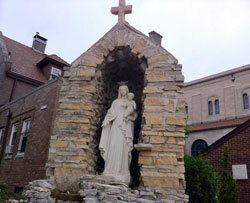 I wound up saying my morning prayers outside the Basilica in front of this little grotto with Mary. 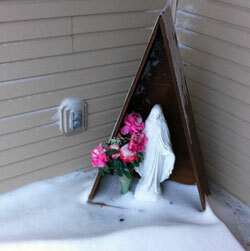 I also traveled to Albany, NY at the end of the week and attended Mass at Christ Our Light in Loudonville. 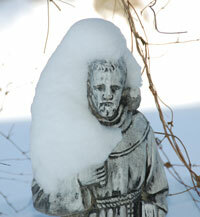 It used to be St. Francis de Sales. I didn’t bother taking a photo. It was the first Mass I’ve ever been to where at least half the people walked directly out from receiving communion. I was attending a 4pm Saturday Mass. People just left in droves. But if you had been there and seen the scarcity of reverence for the church and loose interpretation of the norms you might understand. It has been a rough last two weeks. I came down with the worst flu bug I can remember and then we had a blizzard with 20 inches of snow in mid Missouri. Cindy and I had to fly to Denver for a convention and then I had to fly to another one in Phoenix. Let’s just say that flying, below zero to 70 degree temps and dry hotel and convention centers are not good for your sinuses! But I survived! 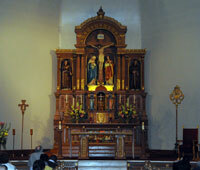 The photo is the altar in St. Mary’s Basilica in Phoenix. It’s conveniently located right across the street from the convention center and has a noon weekday Mass. At the end of Mass yesterday our Associate Pastor, Fr. Ben Nwosu, sang what he calls the Jefferson City Song. Fr. Ben is from Nigeria where life is very different than we can imagine here in the USA. When he was assigned to our diocese he fell in love with our community so he composed a little song that he started singing after Masses. He says that when he has been back home he’s taught it to his family and friends and they sing it there too. I caught part of the song on my phone to share with you. Traveling? Need to know where to find a church and what time Mass will be? Then make sure you’ve got Masstimes.org bookmarked. You can look up churches anywhere in the world. The service is totally dependent on donations too so please help them if you can. Here are some other options to use their service. Enter the zip code desired location and receive a computer-generated response that gives Church locations and Mass times. If the Live operator is not available when you call please leave a message and she will call you back. You can also email the live operator.